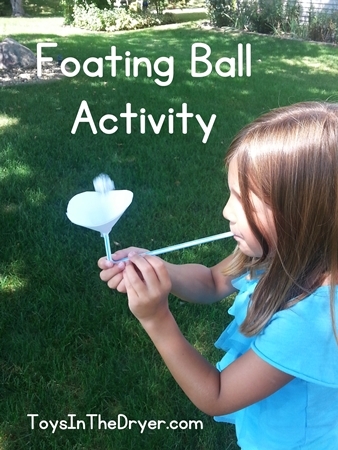 I saw this floating ball activity on Pinterest a few months ago and thought my girls might think it was fun. 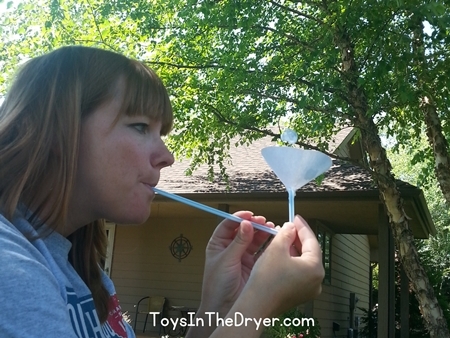 The instructions on how to make/do this activity can be found on All For The Boys. For our circle we traced a CD and for our ball we used tin foil. 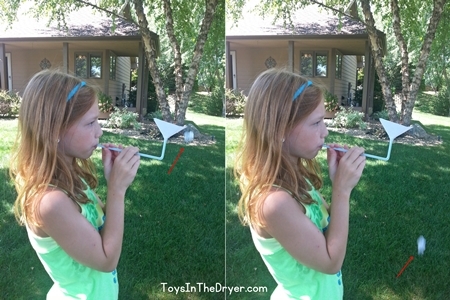 To be honest, my girls were not as impressed with the floating ball activity as I thought they would be. Playing with it lasted all of maybe 10 minutes before they got bored with it and gave up. I’m not sure if they just plain ole didn’t like it or if they thought it was too hard. I gave it a try and it is DEFINITELY harder than it looks! Unless you have a strong yet steady breath, the ball ends up either falling out of the cone more often than staying in or it just moved around inside the cone instead of hovering over it. I’m guessing that’s really the whole point of the floating ball activity but my girls thought it was “lame”. Maybe had it been bit easier we would have gotten more positive feedback. Oh well, chalk this up to another Pinterest fail and another “lame” activity I tried for my blog. P.S. Do you know how many photos I had to take in order to get just two that had the ball floating? ?